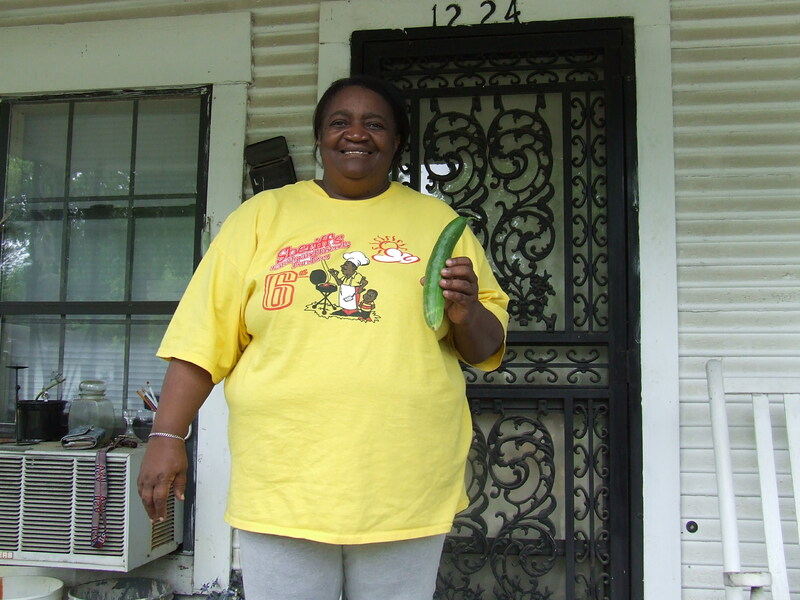 Washington Addition Neighborhood Association president, Blonda Mack, shows off a cucumber from the garden. 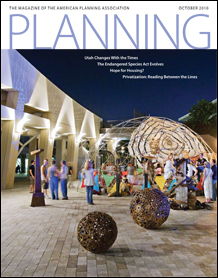 West Jackson’s Washington Addition neighborhood is featured in the October 2010 issue of Planning Magazine. The article covers a pilot neighborhood gardening program that was initiated this past summer by Jackson State University’s Center for University-Based Development and the USDA Natural Resources Conservation Service. Students from the Kids Kollege Summer Program at Jackson State also came by to pitch in. This neighborhood gardens, both located on Booker Street, ultimately produced cucumbers, purple hull peas, squash, tomatoes, and okra that were available for free to the residents who maintained the garden. For more information on the gardens, contact Ms. Mildred Martin, Project Assistant, at (601) 979-5835 or mildred.d.martin@jsums.edu. Vacant properties in the Washington Addition neighborhood of Jackson, Mississippi, are narrow but deep, posing an obstacle in revitalizing the blighted community. But this year, local and federal groups had an idea that beautifies while providing components of a healthy diet for residents. In a first-of-its-kind project, Jackson State University and the U.S. Department of Agriculture’s Natural Resources Conservation Service paired up to transform two vacant 30-by-80-foot lots into gardens planted with okra, squash, peas, and other crops. Residents can harvest the food anytime. The only rule is that they maintain the gardens. “They turned out really nicely,” project coordinator Mildred Martin of Jackson State says of this summer’s gardens. The university has acquired 80 vacant properties in the neighborhood, and one of her office’s goals is to provide healthy food to residents of a state considered among the most obese in the nation. Martin says her office has not measured how much food was yielded, but it was obvious that virtually everything was harvested. The gardens were developed at almost no cost — just a couple of hundred dollars. Volunteers planted them, local farmers lent the tillers, and the NRCS supplied the seeds and the expertise. Right now, NRCS supports farmers and landowners but does not have an assistance program for urban gardens — something organizer Jeannine May says she hopes will change once federal officials see Jackson’s success. “We would like to see more urban gardens, like these two, sprout around the state and across the country,” she says. NRCS’s top state official, Homer Wilkes, says the gardens provide a host of benefits, including a chance for residents to work the land. “Sometimes you have to get back to the basics,” he says. Fritscher is a reporter for the Clarion-Ledger in Jackson, Mississippi. He studies urban planning at Jackson State University’s School of Policy and Planning. this website, and your vkews are pleasant in support of new visitors.